This story was a very interesting start to a new series. 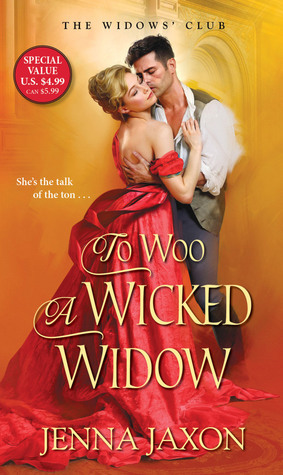 I do not know how it will play out (other than I can assume each future book will be about a widow we met within the pages of this book), but I can't wait to read more about these widows! Speaking just to this story, I very much enjoyed the banter between Nash and Charlotte - these two were definitely evenly matched. I also enjoyed the backstory (such as it was) on Charlotte and her ill-fated first love (even though I fervently wish we could have gotten at least one chapter on her life with her husband and step-sons). What little background we did get on her made her actions and reactions understandable, but I am greedy and would have liked to have seen more. Perhaps then we could have understood her even that much better. I do feel as though the climax of the story was rushed a bit, and I definitely wish there had been more to it (as the rest of this story was like watching a movie in my head as I read it). It seemed there was so much buildup with the robbers that to see that particular arc come to and end the way it did was a let down. Overall, I do believe this story will appeal to those who enjoy a well written historical novel, and I would continue on with this series.